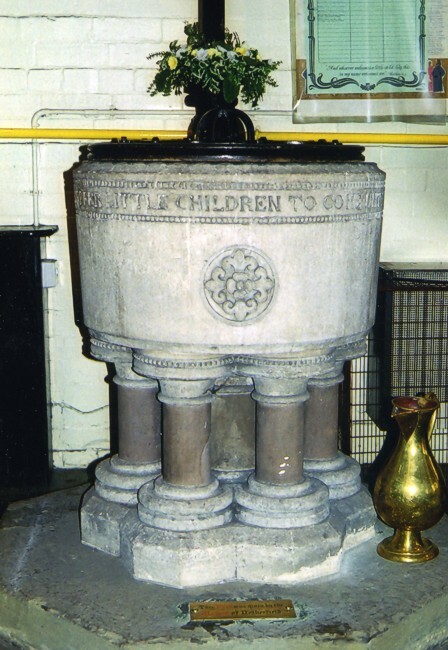 A Tudor rose set surrounded by four Fleur-de-lys petals is carved within a circle on the main body of the font. The font is completed by a lightly carved stained wooden cover, and an iron handle. 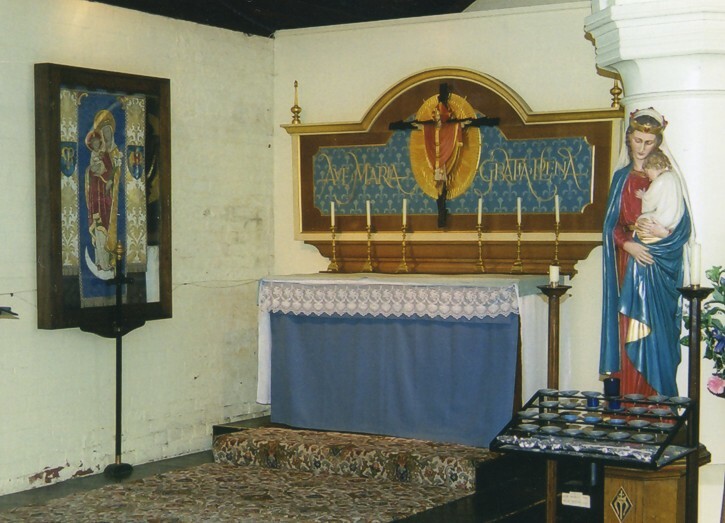 The Lady Chapel occupies most of the north wall of the church The altar table is of pine with three inset panels. It supports a low oak reredos which rises from a moulded plinth to extend beyond the width of the altar table. A plain gold decorated border frames the lower edge and each of the sides of the reredos, which is topped by a simple ogee moulded pediment rising to form a semi-circle in the centre. The central panel within the border is decorated in deep blue, overlaid with fleur-de-lys in a lighter blue. In the centre of the panel, extending into the semi-circle, is a modern crucifix with Christ in a red robe backed by a gold sun blaze oval. 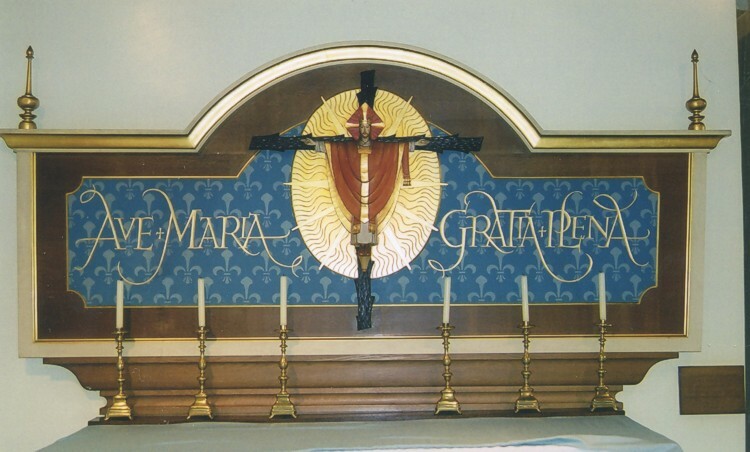 The words ‘AVE MARIA’ are on the left of the crucifix, and ‘GRATIA PLENA’ on the right. 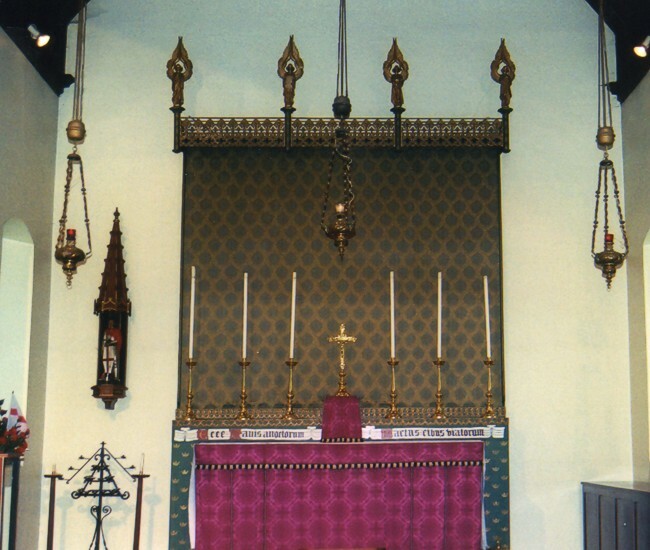 Originally Riddell posts backed by with fabric hangings were above the altar. The seating in the nave is original pine pews originally planned to accommodate 400. Over time they have been reduced in number and re-spaced to the present level of twelve. The west end of the church is now more open than it was originally designed to be. The seating in the Lady Chapel is also pews. In Memory of Basil Walter Truman, vicar 1935/1946. The cost of the altar was said to £400. A painted carved wood figure of St George with resting shield within an carved oak niche surmounted by a banded spire is located to the right of the altar. 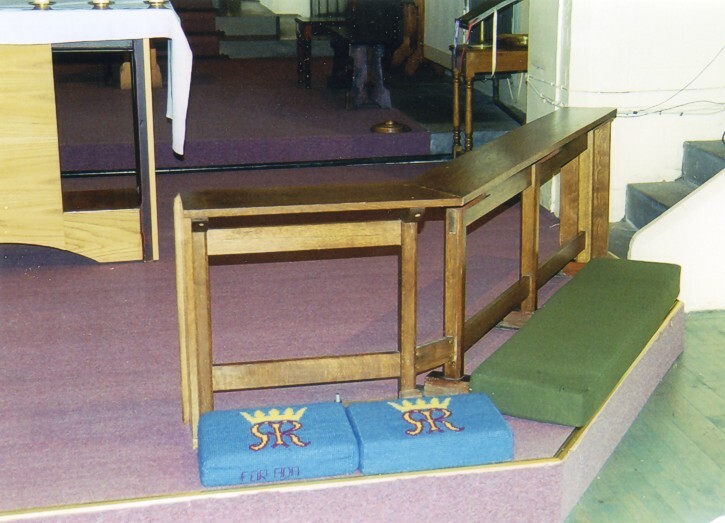 The communion rail of plain medium oak follows the angled line of the chancel step protruding from the chancel arch. It was installed as part of 1947 renovation. 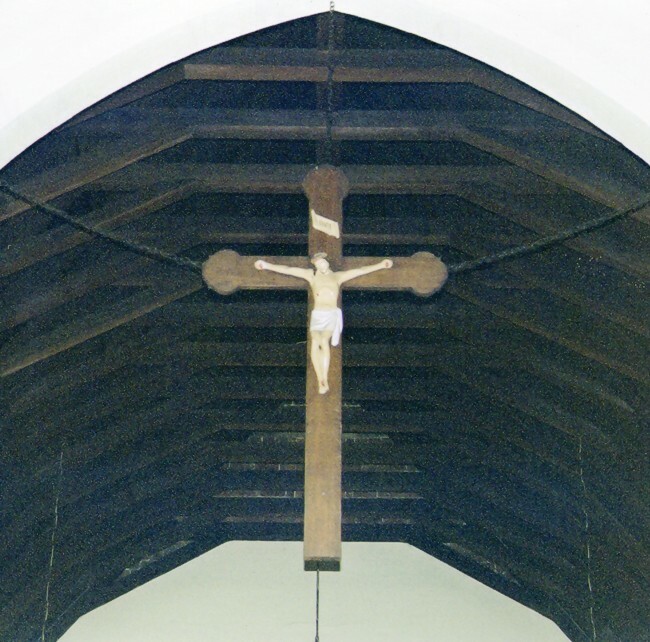 Suspended from the chancel arch is a plain wooden crucifix with painted figure. The pulpit is set to the right of the chancel arch.. It is accessed by four steps leading from the chancel floor to a base, set on a solid cement rendered brickwork base. 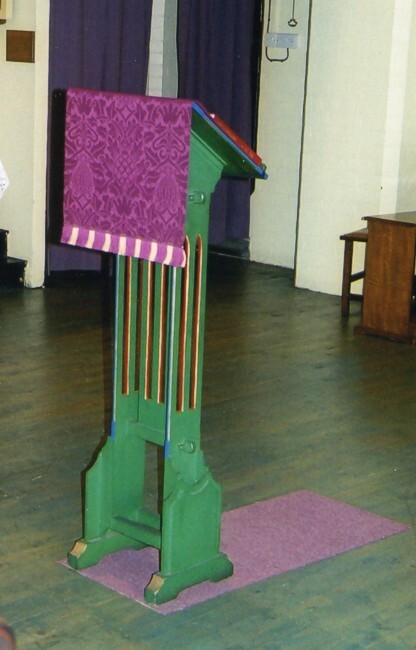 Three painted pine panels each with a carved figure set in relief on a gold painted background form the angled face and sides of the pulpit. This is a very unusual design, possible of Arts and Crafts origin. It is made entirely of painted wood, quite narrow, with two side uprights joined by a centre piece. All three pieces have pierced vertical slots terminated by lancet heads. 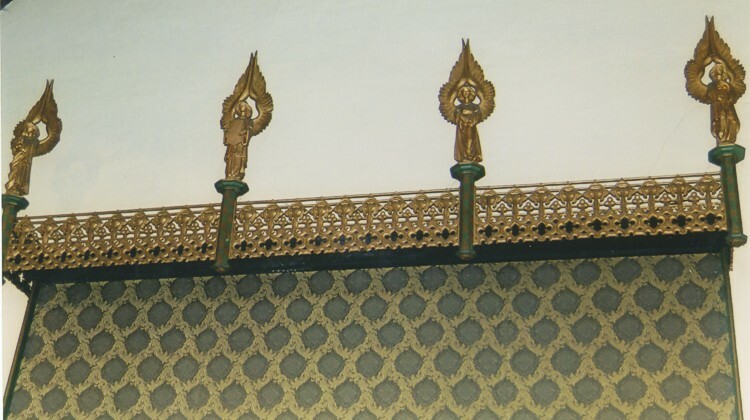 The pierced edges are decorated in gold and with the rest of the woodwork painted bright green. 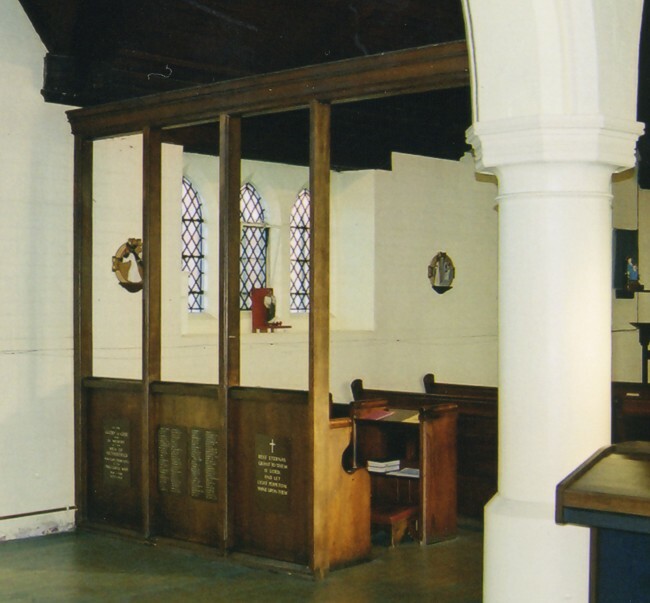 An panelled oak screen is set between the north wall and one of the columns. This forms an entrance to the Chapel and also supports the War Memorial. 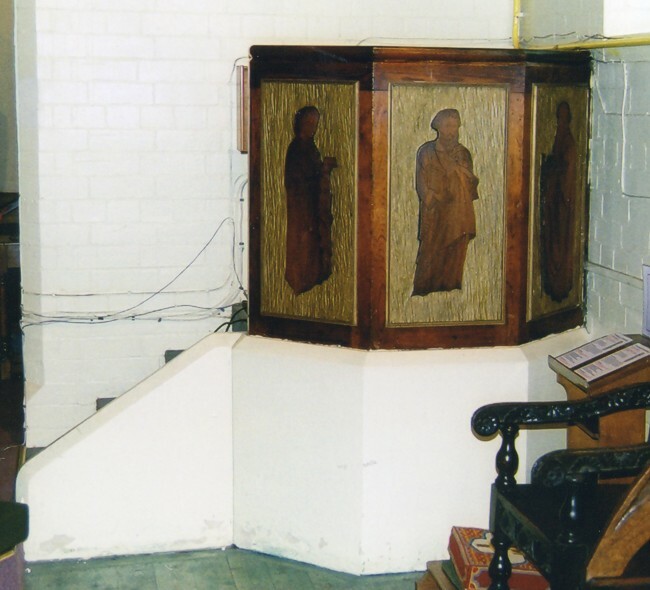 This was installed in 1921 and is said to have originally supported a crucifix with figures of Our Lady and St John. Choir stalls in the nave were part of the original church design. They were removed from the chancel to the nave as part of the 1947 refurbishment. 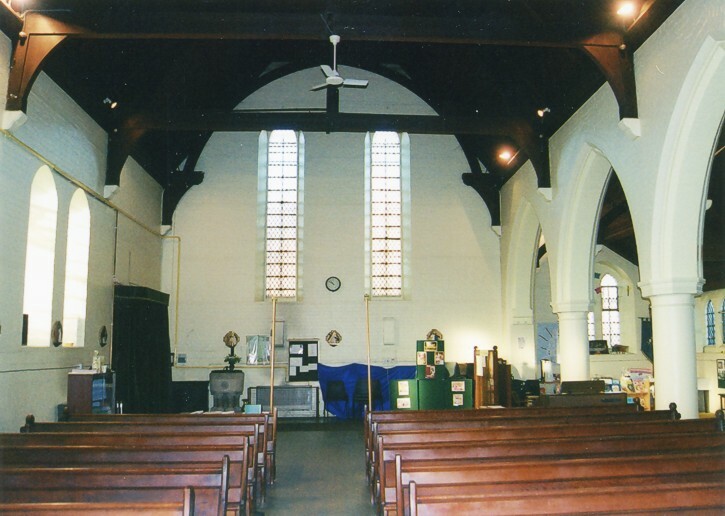 In 1951 the then incumbent the Rev Gibson removed the stalls from the church.